I wanted to bake homemade wholemeal pitta bread after watching Stavros Flatley make some in the programme ‘Sugar Free Farm’ so I looked at various recipes online and compared them. Paul Hollywood says to roll out the bread very thinly (3mm) while Greek recipes have different recommendations for thickness (for example 1cm). 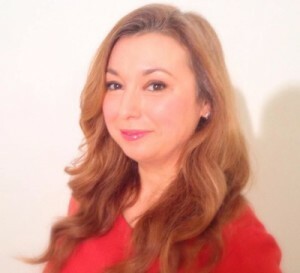 If you’re not in the UK or don’t watch much television, here’s a quick summary: TV channel ITV created a programme in 2016 called ‘Sugar Free Farm‘ and in 2017 the programme came back for a second series. A group of UK celebrities have to give up sugar, eat healthy meals and work in a farm; one of them is father and son duo Stavros Flatley who won Britain’s Got Talent in 2009. In a bowl, mix the flour, salt and oil, then add most of the water little by little but saving some water (about 50 ml) in case the dough is too sticky. Mix well with a wooden spoon for 5 minutes (or if you are lucky just use a machine with the dough attachment and keep it running for 3-5 minutes). The dough should be elastic. Cover the bowl with a towel or cling film (my favourite hack is the lid from a saucepan, it’s surprisingly airtight). Let the dough rise for about 30 minutes: if the weather is very cold, keep the dough near a radiator and make sure it has doubled in size before continuing. 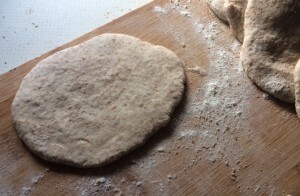 Place the dough on a floured surface and knead it for 5 minutes to let all the air out. 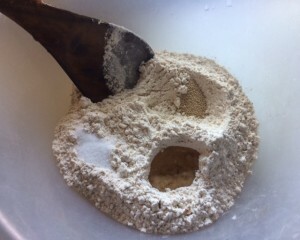 If it’s very sticky, try kneading it a bit more but if it doesn’t change add a dusting of flour. 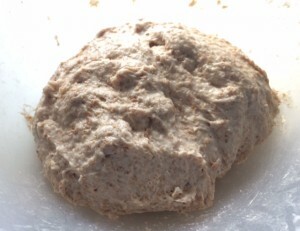 When kneading the dough, try to fold it over itself as many times as possible. 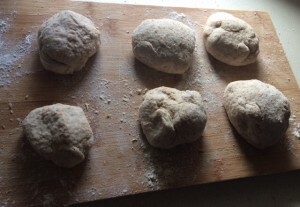 Divide the dough into 6 balls and roll each out with a rolling pin to your desired thickness: I would suggest 0.5 cm but you can make it much thinner if you want. 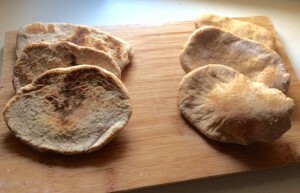 Now you have two choices: you can either bake the pitta breads in the oven or dry fry them in a large pan. Pre-heat the oven to 220 degrees Celsius with a roasting tray inside so it gets very hot. Take the tray out and place the rolled out pitta breads on the hot tray. Bake for 8-10 minutes. Heat a large non-stick frying pan without adding any oil: once it’s very hot, place 2 or 3 rolled out pitta bread in the pan and cook for 4-5 minutes on each side turning regularly to prevent the pitta from burning. Make sure it’s cooked through. The breads should puff up when they cook. I pan cooked 3 pittas and baked 3 pittas (that’s dedication!). I would say the baked pittas were much better, both in terms of appearance and taste: the pan dry-fry pittas were slightly moist inside even though they were crusty outside and that reflected in the taste, which was less intense. The baked pittas puffed up more in the oven and they were nice and dry inside with a nice crisp exterior. I could taste the wholemeal more and the saltiness in the baked pittas so they won hands down. Finally, I would say that the thinner the pittas the better to make sure their inside is cooked through.